ROPE is an interesting movie to watch. Especially when you watch it with a group of friends. Right after the opening credits the audience is treated to a quick and simple murder. Needless to say, the suspense builds up from the start. You can't help but wonder: What else is going to happen? What does the rest of the movie have in store for me? It's brilliance. Pure, long brilliance. In ROPE we follow Branden and Philip. The couple have just murdered their former classmate David, and hid his body inside of an antique wooden chest. After the so called "perfect murder", Branden and Philip host a dinner in the very same room where David was killed. The guests are unaware that David has gone missing, and begin to question his disappearance. Little do they know David is close by, but he is no longer the life of the party (pardon the pun). 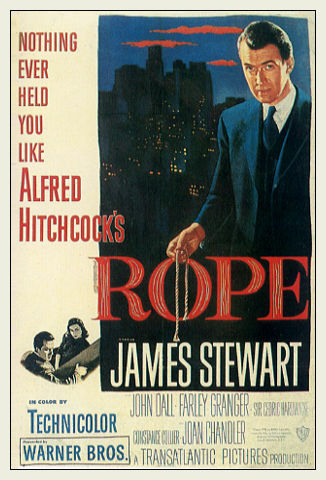 What makes ROPE stand out from Hitchcock's other films is that the entire thing takes place in one setting (much like the next film in our countdown). For about 80 minutes you're stuck inside of Branden and Philips apartment. 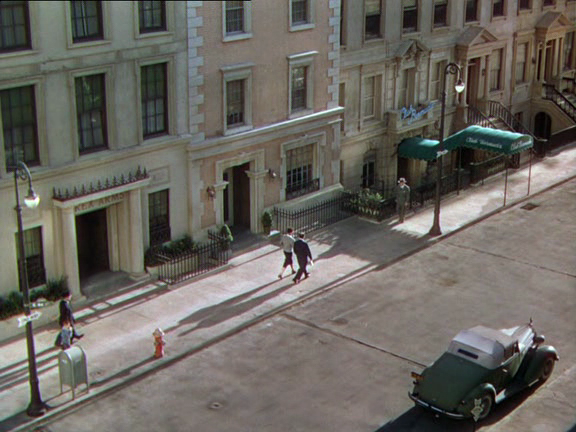 The only time you get to see outside is during the opening credits. For the rest of the picture you're inside the apartment with a view of Manhattan blaring outside the windows. The premise is strange yet satisfying. Branden and Phil throw a party while theirs a dead body in their wooden chest; which is proudly displayed in the living room with the dinner guests eating off of it. The only person in the party who begins to suspect Branden and Phil is Rupert Cadell, the prep-school housemaster and publisher played brilliantly by James Stewart. Stewart's facial expressions alone are great, and for some reason he's the only one who can see throught Phil and Branden's lies. The suspense in ROPE builds you up until the very end, and that's why we love this movie with a passion. It's very subtle, but Hitchcock still manages to keep you on the edge of your seat. ROPE is notorious for its long and extended cuts. There are literally hundreds of cuts in movies where the camera switches from time to time depending on the scene. In ROPE the camera doesn't cut out for long periods of time. In total there's only ten cuts in the film. Each extending for about 5-10 minutes. The longest segment runs about ten minutes and seven seconds. Each part is cleverly edited with blackout shots - continuously panning from actor to actor. 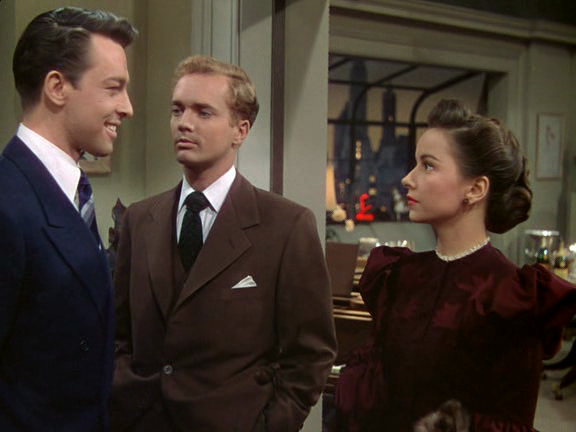 Most segments end by panning against or tracking into an object (a man’s jacket blocking the entire screen, for example). In this way, Hitchcock effectively masked almost all the cuts in the film. It's an experimental piece of art that begs to be seen. Be sure to add ROPE to your Netflix cue if you haven't seen it already. It's such a great film. CAMEO NOTE: Hitchcock has not one but two cameos in this picture. One is in bodily form walking along a street. The other is his trademark silhouette which can be seen on a red neon sign advertising "Reduco" in the view from the apartment window. The neon sign is the little hard to see, so look very carefully!